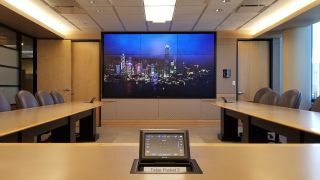 When you're designing and installing a new AV system for the executive boardroom of Hawaii's leading healthcare provider, everything has to be top quality, totally reliable, and easy to use. So when project and sales manager Jeff Kang of systems integrators Custom Audio Video designed this new system, he based it on Symetrix Radius AEC DSPs. "Symetrix is my go-to processor for all of my installs," Kang said. "Symetrix DSPs sound good, they work well with other gear, and they're reliable. I chose the Radius AEC because I needed a DSP processor that did automatic echo cancellation for conferencing, was small and relatively modular, and was easy to control from a third-party system without writing a lot of code. The Symetrix controller number architecture makes it really easy to assign a specific function in a module and toggle it on and off or run a value up and down. As a result, I can deploy it quickly: I plug in the DSP, set up the communications, assign the controller number, and it just works." The Custom Audio Video team removed the old, outdated processor and installed two Symetrix Radius AECs. "For conferencing, we installed 11 Beyerdynamic MPR 210 W horizontal ceiling microphones and a Shure GLXD wireless lavalier mic for the presenter," Kang said. "The Radius AEC has eight inputs with echo cancellation for conferencing, so I needed two units to accommodate 12 mics. I used Dante to get audio between the two DSPs: I brought mics from the second unit to the first unit and AEC reference from the first unit to the second unit, then did some time alignment to account for transmit and receive latency between the units." Custom Audio Video installed eight JBL Control LCT 81C/T ceiling tile speakers, and Kang programmed the Radius AEC so that the lavalier mic is only routed to the speakers at the back of the room. "The room is about 35 feet long, and without absorbing material it's a little hard to hear in the back," he said. "So I zoned the speakers in stereo pairs, front to back, and the microphones at the front only come out the back speakers so people don't have to raise their voice. It's just loud enough to carry your voice to the back of the room. You can stand with the wireless lavalier directly underneath the back speakers, and it doesn't feed back. If someone joins a conference from off site, that goes through all eight speakers." Kang used the Radius channel direct outputs, which do not carry AEC processing, for the sound-reinforcement system. He used the AEC outputs for conferencing. "Automatic echo cancellation prevents echoes or weird delays when they're doing conferencing site to site," he said. "It especially comes into play when the client bridges two difference conferencing types. For example, this client likes to do a video call, with microphones going to the Polycom RealPresence, then dial a phone number and tie a voice-only party in through the analog phone card. With the Radius, they can dial a phone number and connect the two calls so the person on the phone can simultaneously talk with the person on Skype and to everybody in the room. Automatic echo cancellation takes care of all the noise, the echo, and automatic gain, so only the talker's microphone gets turned up, and everybody else gets pulled down a little bit. I use a bit of ducking, a bit of EQ, and some bandpassing." All audio routing is automated. "We gave them Extron wall mount and table pocket touchpanels to turn the speakers up and down, turn the return from the phone call up and down, and turn their microphones up and down," Kang said. "If they turn up the volume on the phone, it brings up the phone in the speakers and the echo cancellation handles anything that happens. But the basic control is one button. You hit the Start button, and it turns itself on, reroutes everything, fixes all issues from the previous conference, and you're ready. You hit the red button to turn it off. Clients should not have to concern themselves with more than that. The company executives were very pleased." Conferences and presentations can be recorded through a non-AEC (dry) output on the Radius AEC to a USB flash drive, using a Denon DN-700R network SD/USB audio recorder in the AV rack. A networked desktop computer in the AV rack is assigned to the room but presentations can be done with just about any sort of Mac, Windows, iOS, or Android device, with virtually any standard connector. "I tried to come up with every use case they could have in the next 10 years and throw it in this room," Kang said. "They're very happy with this system and with the functionality we've provided." When you make the client's executives happy, good things happen. "We're working on other projects for the group later this year, bringing some of their hospital AV systems up to speed," Kang said. "We'll use Symetrix for those systems too. I use so much Symetrix that I have a Symetrix Prism at home for testing different programming combinations. I even have a Symetrix ARC volume control on my desk. They're great DSPs."